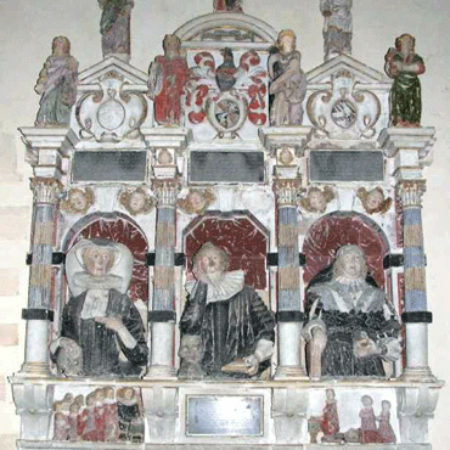 In the small Norman church of St Mary at Meysey Hampton (sometimes Maisey) in Gloucestershire is the charming painted limestone mural monument to Dr James Vaulx and his two wives Editha and Philip. Like many monuments in churches it is no longer in its original position. Today it stands in the south transept where it was moved from the chancel around 1872. Described in The Buildings of England as ‘an elaborate and striking provincial monument’ it embodies many of the features that make monument viewing so fascinating. As noted in a recent publication it is often the grand and sophisticated monuments that command the most attention. But for many people, especially the casual visitor, it is this type of arresting and enigmatic monument that makes their visit memorable and enjoyable. Within the arches of the monument are three full-size half-length portrait effigies. The doctor is in the middle flanked by his wives. He wears a doctor’s gown over a doublet. His hair is curly and he is shown with a pointed beard and a long moustache. 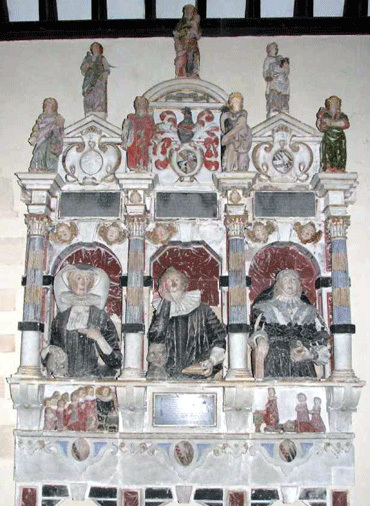 Edith(a) Jenner (d.1617) is to his right and Philip(e) Horton (d.1631) to his left. Editha is turned slightly towards Dr Vaulx while Philip looks ahead. Dr Vaulx and Editha are associated with skulls, a conventional way to indicate they were dead when the monument was erected. Dr Vaulx and Philip have books signifying learning. Philip also holds an open pomander to ward off infection. Possibly she is still following her husband’s advice. 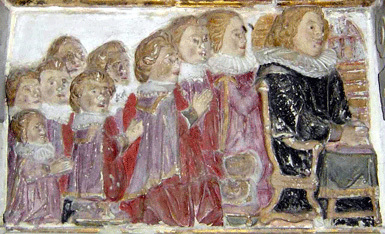 Beneath each wife are grouped small effigies of their children. 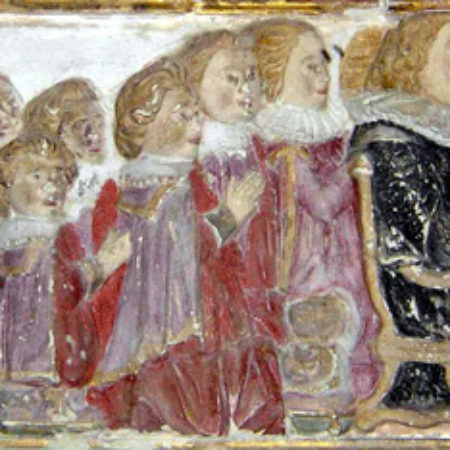 Twelve are beneath Editha including the eldest son Francis who, the only Latin sentence states, was responsible for the erection of the monument, while beneath Philip are her four children. A number of the children are shown in beds, at least one covered in a pall, an indication that some had predeceased their father. Indeed the death of a daughter is mentioned in the inscription above Philip. At the time the monument was erected around 1630 inscriptions had become more numerous and biographical and, with improving literacy, in English. Here there are four, one of which informs us that Dr Vaulx was ‘That famous practitioner in Physicke & Chirurgery James Vaulx Esquire who deceased March 17th 1626 to the generall losse of the whole Countrey….’. His fame was such that it is said he was consulted by James I who thought about appointing him his own royal physician. On enquiring how he had obtained his knowledge and healing art the Doctor replied, ‘By practice’. The King rejoined, ‘Then by my saul thou hast killed money a man, thou shalt na’practise upon me’. Was the doctor qualified? No qualifications have been traced and his name does not appear in the Roll of the College of Physicians. 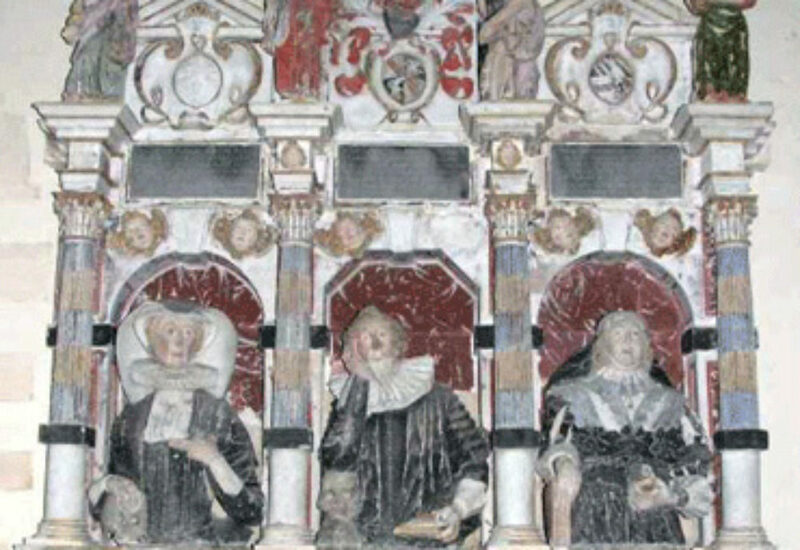 The legacies of the two defining movements that altered church monuments in the sixteenth century are evident. The influence of the Renaissance can be seen in the pose and demeanour of the effigies, the three coffered arches, winged cherub heads, composite columns and Virtues. Virtues were a product of the Reformation, when overly Christian symbolism was suspect, and became a popular method of illustrating the deceased’s exemplary character. Stemming from ancient pagan cultures the most common were the four Cardinal Virtues, Fortitude, Justice, Prudence and Temperance, and the three Theological virtues of Hope, Faith and Charity. Although it is not uncommon to find Virtues on monuments of this period it is not so common to find all seven represented as here. The four Cardinal Virtues form one row on the pediment with the Theological Virtues above. Following 1 Corinthians 13:13 ’And now abideth faith, hope and charity, these three; but the greatest of these is charity’ (King James Bible). Charity, with her children, occupies the apex of the monument. Each Virtue is identified by its attribute many of which are now damaged (some within the twentieth century). Chivalry and family lineage were of great importance as symbols of social status to those who commissioned monuments. This monument includes an esquire’s helmet incorporating a motto ‘Hodie et non cras’, (today and not tomorrow) and six heraldic shields. One of these appears to indicate a prior marriage to a lady of the name of Young but no details of this marriage have been found. We are left with the intriguing questions of whether Dr Vaulx was qualified and how many wives he actually had. The monument is painted although there is considerable flaking. During conservation in 2001 nine paint samples from various parts of the monument were analysed. It was concluded that there were at least two colour schemes which resulted in a change of colour to some of the features. For instance, the robe of Fortitude had changed from blue to red. As with so many monuments it is not an end in itself but a link in a chain and great fun can be had in trying to trace the interrelations between families. Dr Vaulx’s last wife Philip is not buried with him as she subsequently married a Baynham (an illustrious local family). When she died in 1631 her then husband placed a laudatory epitaph on her gravestone in St James Church, Staunton (then in Worcs. but now in Glos.). 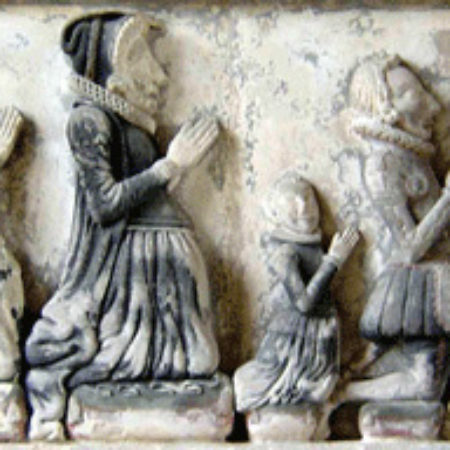 She also appears amongst the three kneeling daughters on the monument of her father, William Horton (d.1615) also in St James Church. Thus she is commemorated on three different memorials.